The Bauer Gallery: How does my camera sensor work? How does my camera sensor work? Before we can continue our exploration into what exposure is, and how to get more out of your camera, we have to hash out a few issues. These issues revolve around what the eye can discern when looking at a scene and what the camera can discern when looking at the same scene. This entry will revolve around the difference between the two and some of the why behind it. The eye is truly a wonderful instrument. It has a dynamic aperture and can recognize billions of colors. Through evolution the eye has been attuned to certain colors better than others. The human eye is more sensitive to green than it is to red. This makes sense because our world is more green than red. Having a hypersensitivity to green would have helped man to hunt. 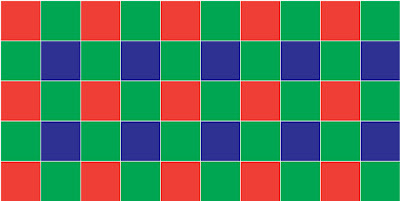 It's no wonder that the Nikon D200's sensor is "CFA Pattern: GREEN RED BLUE GREEN". 50% of your camera's sensor is capable of only reading green! This is what it would look like if you could see the light coming through your lens and striking your sensor. 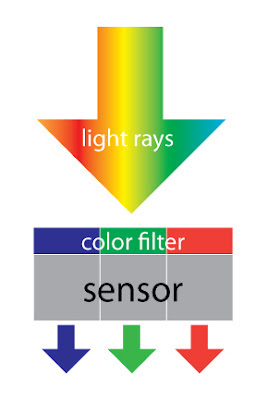 The light passes through your lens, past your shutter, and is filtered by colored filters on top of each pixel sensor. The filter only absorbs one color in the light spectrum and this is recorded onto that pixel. So, if this is true, why isn't your picture nothing but red blue and green pixels when you zoom in far enough? The camera's brain reads the intensity of the color from each sensor and determines how intense it is in comparison to its neighbor. For example. If you shot a picture of a nice green lawn, the light would be hitting the sensor and the green sensor would be getting a lot of light intensity. The red would be getting next to nothing and the blue a small amount also. The camera, would compare these three values and say, "this is mostly green" and would blend the color through all the neighboring sensors. This process is called interpolation and is common in all sorts of image manipulation. The downside of interpolation is that it will soften the focus of your image. this is why people will sharpen their images in photoshop before printing, to offset some of the softening that the electronic sensor automatically does when determining proper color representation. The next lesson will explore why your eye can see more than your film can record.